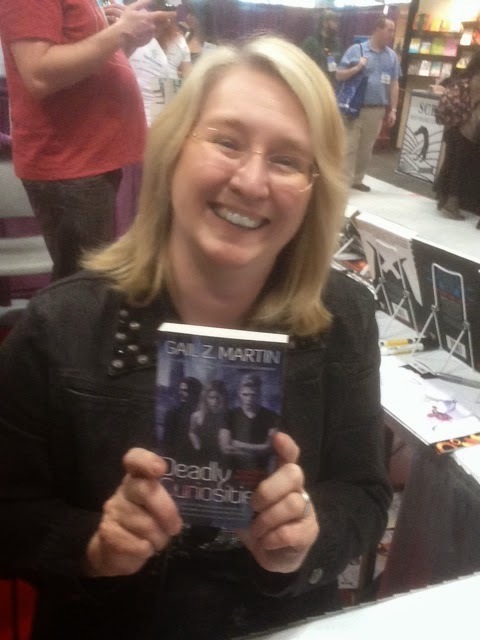 Why write an urban fantasy series after three successful epic fantasy series? Because it’s fun. Truth is, a lot of the same interests run between my epic and urban fantasy. Scratch the surface, and find a history major and museum geek. Plunk me down in a major city with time to kill, and I’ll find the museums. (Heck, I’ll find them in a minor city if you give me time.) And yes, I read the plaques underneath the objects, even when I’ve got the audio tour. I love discovering cool old stuff, weird objects, creepy funeral customs, and pretty things from the past. While Deadly Curiosities happens in modern-day Charleston, SC, it’s a storyline steeped in the past. “Buttons” was the short story I wrote for Solaris’s award-winning Magic: The Esoteric and Arcane anthology (and reprinted this year in the British Fantasy Society’s Unexpected Journeys anthology). It was a contemporary story with the characters you’ll meet in the novel. But before that, I had written short stories in the Deadly Curiosities world spanning the 1500’s and 1700’s for other anthologies. Sorren, my nearly six hundred year-old vampire, is the thread of continuity through all the stories. In Vanities (originally published in the British Fantasy Society’s The Bitten Word), we see Sorren’s first job for the Alliance, battling a demon in Antwerp in 1565. I’ve written two other stand-alone short stories that follow up on Vanities: Wild Hunt and Dark Legacy, that show more of Sorren’s origins, tell the story of his maker, Alard, and hint at the creation of the Alliance. The very first story about Trifles and Folly, the antique shop in Deadly Curiosities, appeared in the Rum and Runestones anthology and was set in the 1770’s, just before the American Revolution. The anthology prompt required pirates and magic, which is what Steer a Pale Course delivers. That story was popular enough to get me invited back to the Spells and Swashbucklers anthology, with The Low Road. Then Marie O’Regan tapped me for The Mammoth Book of Ghost Stories by Women, and Among the Shoals Forever was born. Sorren’s past is Old World—Europe and old gods and ancient monsters. His maker battled Viking warriors and gained the help of a Norse Seior. A hundred years later, Sorren travels to Charleston to set up Trifles and Folly in 1663, forging a long-standing arrangement with one of Cassidy’s ancestors. As in New Orleans, the younger sons of European gentry came to Charleston to make their way. Men with service to the crown received land grants and set up sprawling plantations. Fortunes were won and lost. And while Charleston is known as the “Holy City” for its hundreds of churches, beneath that piety ran rivers of blood in brothels, duels and slavery. Look beyond the beautiful mansions and gardens heavy with bougainvillea, Spanish moss and gardenia, and you’ll find the tragedy of the slave trade. Charleston was part of the “Triangle Trade” with the Caribbean—molasses, rum and slaves. By some accounts, the majority of slaves in the U.S. came through Charleston Harbor. Those slaves brought their beliefs with them, religions that melded and changed to create the Voodoo of New Orleans and the Hoodoo of the Lowcountry. Charleston’s past rests uneasily, not far below the surface. While New Orleans has always embraced its wild side, Charleston opted for repressed propriety. But like a convention of accountants in Las Vegas, even the proper folks have to let loose sometime, and Charleston’s back alleys were the place for indulgence. Duels were fought. Pirates were by turn welcomed and shunned in Charleston depending on the benefit to the city’s fathers. Blackbeard himself blockaded the city in 1718. The city’s history is full bad boys and wild girls. I’m very excited about Deadly Curiosities and the chance to spin tales about haunted objects, dark magical items and cursed heirlooms. And I’m thrilled to be working on the second book in the Deadly Curiosities series for 2015 with even more thrills and chills. If you want more of Cassidy, Sorren and Teag right away, check out my free novella on Wattpad.com: The Final Death. Coffin Box and Wicked Dreams also continue the adventures of Cassidy and her team, and you can find them with my other ebook short stories on Kindle, Kobo and Nook. Cassidy and crew will be turning up in a couple more anthologies this year. Retribution, an all-new Deadly Curiosities adventure, is featured in the Athena’s Daughters anthology by Silence in the Library Publishing. The Restless Dead will be in the Realms of Imagination anthology from Dark Oak Books. So the next time you pick up that family heirloom, pay attention if your fingers tingle or you catch a glimpse of something that isn’t there. Cassidy can tell you, the past may be gone, but it doesn’t stay buried. 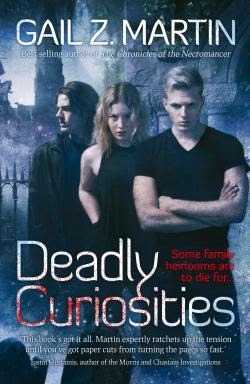 I’ll be celebrating the launch of Deadly Curiosities the whole week of June 22-29 with more than 30 different guest blog posts, a Facebook launch party featuring prizes, guest authors and surprises, podcasts, three different excerpts, a Reddit give-away/AskMeAnything and a Goodreads party/give-away. Get all the details at www.DeadlyCuriosities.com, follow me on Facebook.com/WinterKingdoms or on Twitter @GailZMartin! I’ll be signing Deadly Curiosities in major cities across the U.S. and in England, Wales and Scotland this summer—the full book tour schedule is on my website, so please stop by and say hello!